I have two large parrot fish, at least 4" who are approx 8 years old. They are the only fish in my 26 gallon tank. They are eating very well and generally appear happy and healthy ( they lose their bright orange color frequently but it returns) within hours. They have started a weird swimming to the top and bumping hard at the top of the aquarium. So hard they splash water out. Should I be concerned by this behavior? I have two large parrot fish, at least 4" who are approx 8 years old. They are the only fish in my 26 gallon tank. They are eating very well and generally appear happy and healthy (they lose their bright orange color frequently but it returns) within hours. My question, They have started a weird swimming to the top and bumping hard at the top of the aquarium. So hard they splash water out. Should I be concerned by this behavior? I currently have 2 parrot fish that are approximately 10+ years old living in a 75 gallon tank. The water quality is good, gets partially changed every 3 weeks (including filters) (approx 25 %) and has been since I set up the tank 10 years ago. The last 2 weeks one of the fish has been off food so I did a partial water change and no improvement. The past 24 hours he has been sitting on the bottom of the tank not doing much. I'm not sure what to do next?! At first I assumed perhaps he's dying of old age, but would hate to make that assumption. I do keep a close eye on water quality and have for the past 10 years and the fish have been extremely healthy with no problems. I know how easy it is for fish to get sick with overcrowding and poor water quality and that all appears to be good. Is it possible he died of old age? I've done some research on your website and I find a lot of references to 7 years of age as being "old" but it doesn't say what the typical life span is for the parrotfish. As usual I appreciate all your help! I just inherited a 45 gallon tank. I decided to get 2 Blood Red Parrot Cichlids. At the pet store, there was a tank with 2 Parrots in it. They looked very healthy and came right up to the glass and followed my finger. I began filling the water in the new/used tank and apparently the previous owner used an under gravel filter and my water was now FULL of poop! I then put the parrots in another 40 gallon community tank temporarily, realizing the error of my ways. In the temporary tank they hid most of the time but would come out when no one was looking and were still eating. A week later the new tank was ready. I did not put very many hiding places because I wanted them to stay out. They completely went crazy zipping from one side to the other, terrified. They even ran their head on the filter as they passed. So, I put hiding places in their for them. I let them go for a few days to let them get used to their new home. They wouldn't move or eat.. They just laid on their side and hid. I did some more research and found it recommended to put other fish in the tank for the Parrots to watch. The idea being that when they see that no harm comes to the other little fish they would feel more comfortable and come out. So, yesterday I got 3 silver dollar fish and put them in the tank. I immediately saw the 2 Parrot fish perk up a little and watch the new fish. One Parrot even sped from his current hiding place to where the other was hiding and squished himself against the other, but they still didn't eat. I am writing in hopes that you might have some suggestions on how else to make them happy and comfortable. I bought 4 red parrots and 2 Oscar babies four days back .... they are good and eating well and fighting well .... hiding well also in this four parrots one parrot was having a black spot on its upper lip when I was getting it ... and now I noticed they are having similar spots on its belly also and is black in colour...I never noticed this when I was getting this.... but the fish is normal in eating and playing ... but its a bit aggressive than other fishes its always fighting and butting other fishes .... it is the biggest fish in all the fishes ... I don know weather its a disease or just colour of the fish . pls help . Keep the tank lightly stocked. Allow 80-100 litres per Blood Parrot. Stir into each bucket of water, and then do your normal water changes. Do not add directly to the aquarium, and do not change all the water all at once! Use a robust filtration system. Aim for a turnover rate of not less than 4 times the volume of the tank per hour, and ideally 6 times the volume of the tank. In other words, if the aquarium is 200 litres in size, the filter should be rated between 800 and 1200 litres per hour. Do weekly water changes of 25%. Do not overfeed; ideally, skip a day. Use food sparingly, and remove uneaten food within 5 minutes. Better to feed two small meals per day than one big meal. Do not use any sorts of live foods; only use pellet foods, vegetables, and things you'd eat yourself (like little bits of prawn or tilapia filet). degree Celsius. All the fishes are keen to eat the pellets but it does not eat. I had put it into the hospital tank for about 16 hours but nothing seems to happen. <What did you do while the fish was there (treatments/medication?). the other parrot fish is plump and easily eats food. I have provided it with antibiotics but the matter is still not improving. it is not able to swim properly and sometimes pant at the surface. I also increased the oxygen supply. Please tell me a solution. feeding, as well as water quality, I think we can get this guy "fixed up." http://www.wetwebmedia.com/FWSubWebIndex/FHParrotCichArtNeale.htm and those linked pages below the title of this article. I am feeding them pellets, blood worms <Are these wet-frozen or freeze dried?> and coz <not a word...> I have turtles I am giving them turtle food. The other fishes also like to eat turtle food. <Yes, I did, but these aren't especially revealing.... looks like an upside-down fish. You're not giving me some of the information I need in order to help you. I really need to know what your water parameters are (Ammonia, Nitrite, Nitrate). Did you read where I referred you? Please read where I referred you and use the search bar available on WWM to help yourself. You're treating this fish for illness he does not have, then throwing him in a tank full of antibiotics for less than a day, etc., and what you need to be doing is reading so that you can make educated decisions. What you're doing now isn't going to help your fish. Please feel free to write back after you've read where I've referred you and you can provide me with numbers for those levels I mentioned earlier. In the meantime, you can feed your fish the inside of peas -- take cooked peas and squish the insides out of the shell, and feed to your fish. This may help if the problem is constipation. I'm hesitant to tell you to do anything because I don't have the whole picture right now -- you're not providing data re: water quality, and most problems fish encounter are directly related to water quality. 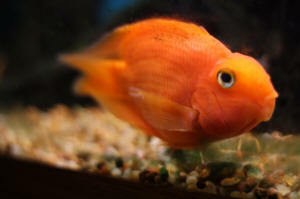 I read in the web page how to care for the blood parrot. Actually I cannot check the water level quality because the testing equipments are not available at the local aquarium shop. But I do regularly change water after15 days or so. I have two internal filters and one under gravel biological filtration unit. The tank capacity is 85 litres and the fishes are pair of Koi carps, pair of silver dollar, pair of Gourami an iridescent shark and a sucker mouth catfish and 4 turtles. The foods which are mentioned in the previous mail are freeze dried. Also the other parrot keeps pushing this parrot. 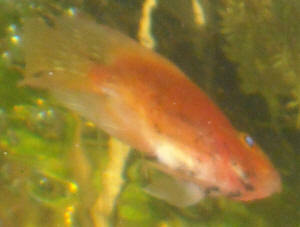 the picture showed an upside down fish, it is the real problem .Thanks for your advice. <This tank is 85 liters? I hope that is a typo. All of those fish are in there? This tank is seriously overstocked. I would find a shop with test kits as soon as you can. How long have you had this setup with these fish? I'm really very surprised that this is the first problem you've seen! As for the food, you really should be feeding the wet-frozen foods as well; switching over to wet-frozen bloodworms rather than your freeze dried would help, and feeding the peas like I mentioned earlier would help. I think your problem here is water quality. Turtles are very, very messy, and it's usually advised not to mix them with fish due to that fact. Other than that, you don't mention how large these fish are, but some of the fish you have can grow to one or two feet long. Are you planning an upgrade? I would begin to plan this as soon as you can, and try and come up with a plan to separate the turtles from the fish. Please read re: each of the species you're keeping here on WWM using the Google search tool if you have any questions about the ultimate needs of the animals you're keeping. My parrot fish has eaten boiled peas as you have said. It has also started swimming properly but when it eats the other parrot attacks him and he sways to the other end. I have made plans to separate the fishes and the turtles and I am also planning to make a bigger aquarium for my fishes of 172.5 litres. <This is not large enough -- you have the Koi who will need much, much more than this all by themselves.> I cannot afford a bigger aquarium due to lack of space but its twice bigger than the older one and the turtles will also not cause any problem. Please advise me how I can stop the war between the two fish because and I think it is the secondary problem. The first has been solved. <I suspect the first problem has not been solved. You will begin to see more problems in more fish because this tanks is an accident waiting to happen! As for the secondary problem, I would remove the sick fish to a cycled hospital tank and allow him to get better in good water quality, and return him once he's strong enough to handle the aggression of the second fish. However, these are Cichlids. As they grow and mature, problems with territoriality and aggression are going to worsen. Again, I ask that you look into the needs of these fish on WWM -- you'll find that many fish you keep do not mix -- in terms of required temperature, water chemistry, "attitude" -- territoriality/aggression, needs as far as behavior (single-specimen vs. schooling), etc. I would read, and then pare down my stock accordingly until you have fish which can actually live in this tank. I have two parrot fishes and the bigger one always keeps attacking the smaller parrot. When the smaller one eats it attacks him and pushes him into the corner. To get saved the other parrot pretends as if it is dead and keep lying in a corner. And now it has been his habit to lie in a corner. The other parrot also attacks other fishes. It disturbs the whole silent atmosphere of the aquarium. <Please refer to my other response to you today -- I think these problems stem from over- and mis-stocking and the aggression and water quality issues which accompany those problems. I hope you get this e-mail in best of your health. 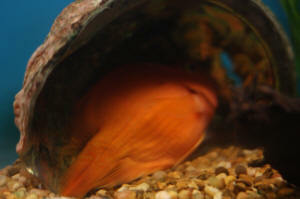 Neale I have two blood parrot cichlid one was reddish orange and other was in blue colour. wrong but I am too much worried about this. Please help me what should I do. I will be thankful. I have a Parrot cichlid for 5 yrs now. He is great! but in the last week he has started to stay in his house a lot. He eats fine, his color is fine. He usually comes out when I get up but he is staying in his house lately and he usually does not go back in until I go to bed, now he stays in there all day. Is there a reason he is doing this? Thank you for getting back with me. I have never blogged or email anyone so I wasn't real sure how this worked. I don't think any of that is the problem. His tank is 30 gallons or more and he lives by himself. That is why I was wondering if he needed a friend or something. and jaws, they can't handle themselves with regular cichlids, which have been fine-tuned by evolution to be able to swim, feed, and fight very well. I could not find information really about what other kind of fish I could put in there with him. He usually comes out and follows me all around, like watching me when I'm in the computer room then he usually watches TV with me but now he is just staying inside his house watching TV from the hole in the bottom of his house. It's kinda of sad!!!! Any suggestions? Hello, My name is Suzanne. I have a cichlid that's in need of help. He's bright orange (solid color, no spots), about 4 inches long- I don't know what type he is. and looks fine overall. His color has not changed, he has an appetite, there are no strange spots (except a very miniscule black spot on his head). When he swims, at times he seems absolutely fine. Other times, it looks like he's putting a tremendous amount of energy into swimming, but he doesn't seem to move very far. It even looks like he's twitching sometimes. Very spastic. Other times when he leaves the shell (which is rare), he hangs out on the floor of the tank and eventually, starts looking unsteady, and veers onto his side momentarily. Inevitably, he returns to the shell and stays there. I'm not sure, but he looks like he's breathing heavy. It's hard to tell. The silver dollars seem absolutely fine. They're swimming around and look very healthy. They're not bothering the cichlid anymore at all. They pretty much leave him alone when he comes..
maybe approaching him a bit, but it doesn't seem particularly aggressive. We checked the water levels. The pH, nitrite and ammonia levels were fine. The nitrate levels were slightly elevated. We changed 1/3 of the water, cleaned the filter (but didn't clean/change the little cylindrical pieces in the filter, or the pellets- to not over-clean), suctioned the gravel, and changed the air pump so that now the bubbles it generates are considerably stronger than before. The water temperature is at approximately 89 degrees. < Thanks for the photos. They were very helpful. The silver dollars have ganged up on your parrot cichlid. He is now very stressed and may have an internal bacterial infection. 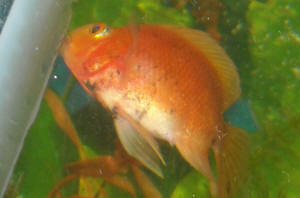 This cichlid cross does not defend himself very well and is easily picked on by other fish. If the silver dollars are removed he may swim normally. If the silver dollars are removed and he's still has a swimming problem then there probably is an internal infection.